Tomorrow is Sofia's big day!! Her Disney Junior series premieres on The Disney Channel!! If you have a little Disney princess in your house I am sure she can hardly wait!! I think that calls for a Sofia Tea Party!! There are no decorations included in today's party board since it's meant just for you and your favorite little princess, I will have a Sofia The First Party Board soon!! Sofia Coloring Page - This adorable coloring page is from Disney's Spoonful site. A fun activity for your little princess once the Sofia The First episode is over. Cup Full of Veggies - I was trying to keep the food little princess friendly and these small cups filled with healthy veggies are perfect. Be sure to fill them with all of her favorites!! Princess Tea Set - I just couldn't resist using this adorable Disney Princess Tea Set for the party board, but any teapot and cups will do. If your princess is not a tea drinker, fruit juice would be a perfect substitute. Cucumbers - English cucumber sandwiches are a staple at tea time, but might not agree with your little princess's pallet. Substitute cucumber slices which she is sure to love!! Princess Sofia Costume - No one does costumes better than the Disney Store!! This one is part of Disney's Sofia The First Collection. Don't have a Sofia costume, that's OK she can dress as any of the Disney Princesses most of them are scheduled to appear on the show this season. DIY Sofia Tiara & Amulet - Thanks again to Spoonful!! This Sofia tiara and the Amulet of Valor. 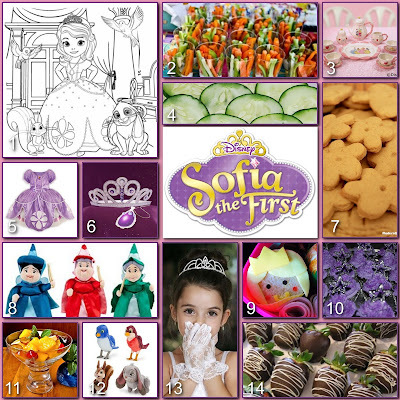 Download the print and cut file tonight so you can have it all ready for your princess when Sofia The First premieres. Butter Cookies - This is a wonderful recipe from Modern Wife, but store bought ones are great too. If you have a Tea Cake recipe from Grandma this would be the perfect excuse to make a batch. Flora, Fauna & Merryweather - Have the Good Fairies join your princess for a Tea Time lesson. Princess Sandwich - Love this Bento princess sandwich from Art In The Box!! A nice change from my usual crown pb&j!! Purple Cupcakes - Every princess has to have a signature color, and for Sofia it's purple. Bake your own or get white cupcakes from the grocery store and let your little princess add purple sanding sugar or sprinkles!! Fruit Salad - All kids love fruit!! Put together a quick fruit salad and place it in a fancy serving dish or glass, it will make your princess feel extra special!! Mia, Robin, Whatnaught & Clover - Don't forget to invite Mia, Robin, Whatnaught & Clover to the tea party too!! White Gloves - LIttle girls are so cute in tiny white gloves! They make your tea party extra formal and special. Chocolate Strawberries - The perfect little bite at the end of your tea party!! Hope you all enjoy Sofia The First and tea party for your own special princess!! I would love to see pictures if you have a tea party!! So cute! My girls love Sophia! I think we need to have a tea party - you have lots of cute ideas! Delighted that you found my fruit salad post and linked to the site. Who wouldn't love a proper tea party, white gloves and all?